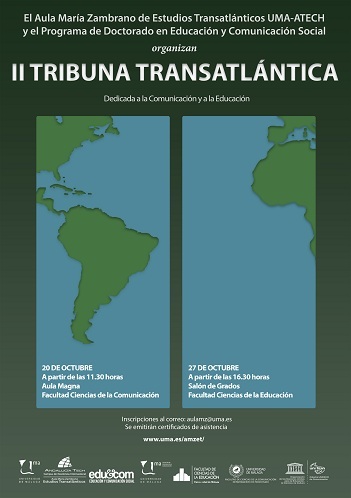 The Aula María Zambrano of Transatlantic Studies UMA - ATECH and the Education and Social Communication's Doctoral Programme have organised the 2nd Transatlantic Tribune. 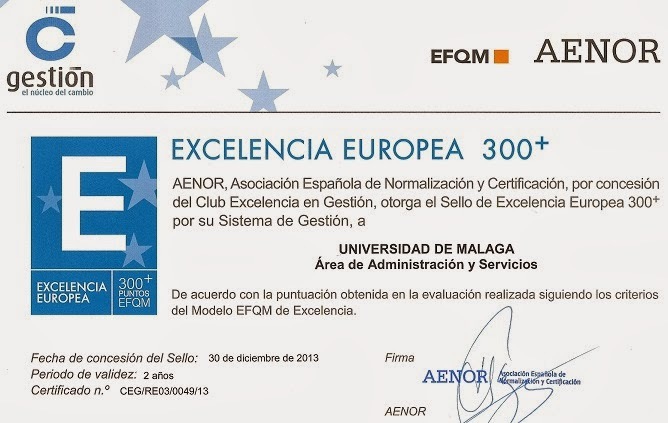 Dedicated to Communication and Education, the Tribune took place the 20th and the 27th October 2015 in the Aula Magna of the Faculty of Communication Sciencies, and in the Salón de Grados of the Faculty of Education Sciences of the University of Malaga respectively. 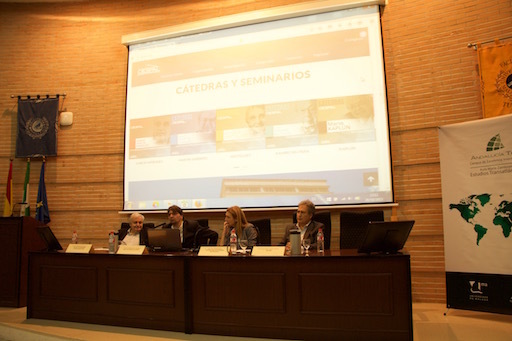 Mª Chantal Pérez, vice chancellor of University Extension, and Juan Antonio García Galindo, dean of Communication Studies Faculty and director of the Aula María Zambrano of Transatlantic Studies, took charge of the opening. 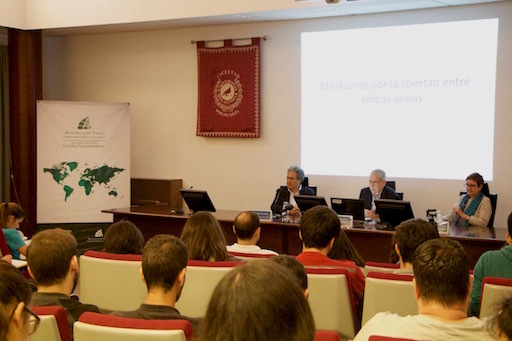 Bernardo Díaz Nosty, director of the Journalism’s department and director of the Communication's UNESCO Chair of the University of Malaga, introduced Francisco Sierra Caballero, general director of The International Centre of Communication Higher Studies for Latin America CIESPAL. Sierra Caballero, expert in Communication and Latin America, held the "Theory of Educational Communication" conference, where he pointed out the new challenges faced by education and he informed about the different actions that they carry out in Revista Chasqui, quarterly publication regarding communication in Latin America. On Thursday 27th October Juan Antonio García Galindo, also director of the Aula María Zambrano, and the coordinator of the Education and Communication Doctoral Programme Nieves Blanco García introduced University of Malaga's professor Carlos Pérez Ariza, who recapitulated the career of distinguished figures in history as Bernardo de Gálvez and Francisco Miranda on both sides of the Atlantic on the conference "The effort to bring freedom to both banks. An Approach to the american heroic deed for independence". This way, the professor stood up for the necessity of creating new organisations that study the international Atlantic relationships. 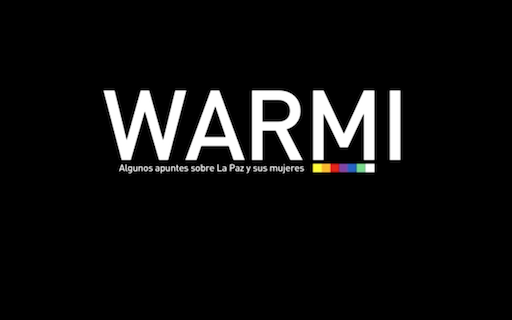 To conclude the 2nd Transatlantic Tribune, the professors of the University of Malaga Inmaculada Postigo Gómez and Ana Jorge Alonso introduced the documentary "Warmi. Some notes about Peace and its women". This diary, filmed by Alejandro Alvarado and Concha Barquero, is product of an international cooperation project between the University of Malaga and Bolivia and it helped to empower the Latin women with a discussion moderated by Javier Barquín Ruíz, professor of the University of Malaga. /cms/secciones/ajax/insertar_seccion/ /cms/secciones/ajax/borrar_seccion/ /cms/secciones/ajax/editar_seccion/ /cms/secciones/ajax/mover_seccion/ Are you sure you want to delete this section? 88658 You are about to cancel the edition. All your changes will be lost. Do you want to cancel and lost your changes?